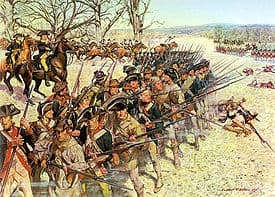 The Battle of Wetzell’s Mill (the name may also be spelled Weitzell, Weitzel, Whitesell, or Whitsall) was an American Revolutionary War skirmish fought on March 6, 1781, between detachments of Nathanael Greene’s Continental Army and Banastre Tarleton’s Loyalist provincial troops. Greene was trying to avoid encounters with the larger British Cornwallis’ larger army while awaiting the arrival of additional troops, and had sent Williams and several hundred men on reconnaissance to watch Cornwallis’ movements. Cornwallis learned where Williams was on March 4, and, realizing he could be trapped because he was separated from Greene’s army by Reedy Ford Creek, sent Tarleton and 1,200 men toward the ford at Wetzell’s Mill. Early on March 6 Tarleton’s men tried to sneak up on Williams’ position, then about ten miles south of the ford. After a brief skirmish, the two forces raced toward the ford. Williams kept Harry “Light Horse” Lee in the rear to cover their retreat, and reached the ford ahead of Tarleton. His army crossed, at which point he decided to make a stand at the crossing. Tarleton’s first attempt to cross was repulsed, but the second succeeded, and Williams retreated. 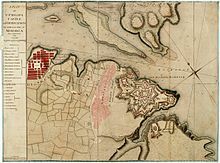 The British attempt to regain control of its rebellious colonies in the American Revolutionary War through the “southern strategy” of gaining control over the southern colonies and moving north began in late 1779 with the capture of Savannah, Georgia. By early 1781, Georgia and South Carolina were nominally under British control, two Continental Armies had been captured or routed, and General Lord Cornwallis was chasing a third, under the command of General Nathanael Greene, out of North Carolina. 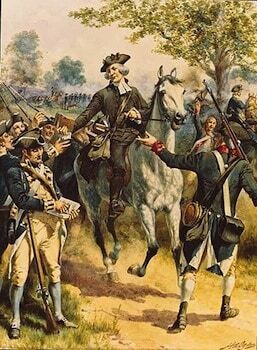 Greene, with a smaller and more mobile army, had risked division of his forces at one point, and was rewarded with Daniel Morgan’s victory over Cornwallis’ main cavalry force, led by Lieutenant Colonel Banastre Tarleton, at the Battle of Cowpens in January 1781. Cornwallis, realizing he could more easily defeat Morgan or Greene before their forces rejoined, stripped his army of all nonessentials, and gave chase. Greene and Morgan were able to join forces, but they were still relatively weak due to expiring enlistments, so Greene continued to retreat northward toward Virginia, avoiding full-scale battle, in what became known as the “Race to the Dan” (after the Dan River, which flows near the border between Virginia and North Carolina). Greene beat Cornwallis to the Dan, which, like many other rivers, was swollen by heavy rains, and crossed to relative safety in Virginia. After receiving additional supplies and some reinforcements, Greene recrossed the Dan with an eye toward finally forcing a confrontation after additional troops arrived. Criss-crossing the area around Guilford, North Carolina with his main army, Greene detached Colonel Otho Williams with companies of light infantry, riflemen, and the cavalry of Henry “Light Horse Harry” Lee to maintain contact with Cornwallis’ army so that he could continue to maneuver without a large confrontation. Cornwallis sent out Tarleton on expeditions to find Greene’s army so that a confrontation could be forced. On March 3, Williams sent out a company of men to harass the British camp. They killed several sentries and took two prisoners before returning to Williams’ camp at Wetzell’s Mill, near a ford across Reedy Ford Creek. Cornwallis ordered Tarleton out on March 6 to go after Williams. Williams was alerted to Tarleton’s approach, and managed to withdraw most of his men across the ford, where they established a defensive line. Tarleton’s men then drove the last of Williams’ light infantry across the river. Tarleton sent a company of men from the 23rd Regiment under James Webster to storm across the ford. Williams’ riflemen were ordered to target the officer, and Henry Lee reported that they “discharged their rifles at him, one by one”, but “himself and horse were untouched”. 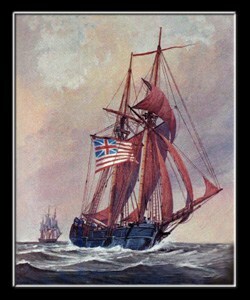 The British eventually succeeded in crossing the creek, and after several miles of pursuit, Tarleton gave up the chase and rejoined the main army. Williams and his men rejoined Greene’s army, which, following the arrival of 2,500 reinforcements, prepared to meet Cornwallis near Guilford, North Carolina, where the key Battle of Guilford Courthouse was fought on March 15.